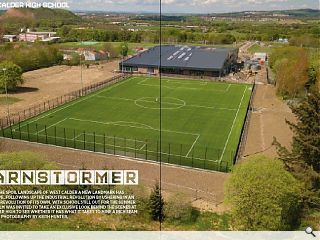 Amongst the spoil landscape of West Calder a new landmark has taken shape, following up the industrial revolution by ushering in an education revolution of its own. 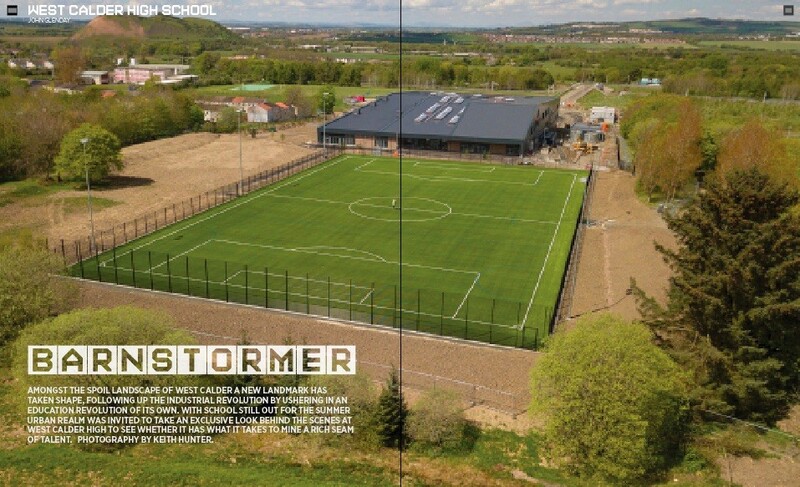 With school still out for the summer urban realm was invited to take an exclusive look behind the scenes at West Calder High to see whether it has what it takes to mine a rich seam of talent. Photography by Keith Hunter. 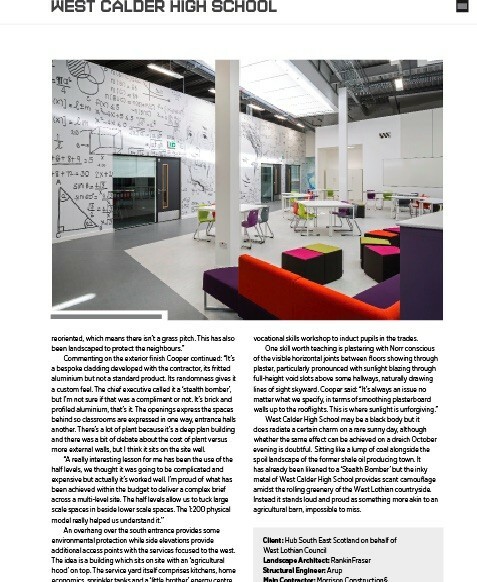 As West Lothian Council unwraps the all new West Calder High School, fruit of a £32m investment, the largest single investment in education it has ever undertaken, Urban Realm took the opportunity to peek inside this cavernous school before teachers and pupils move in. 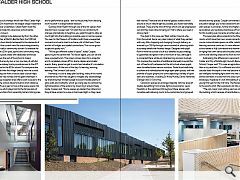 The first of two siblings to be delivered by Norr, the other being its larger brother at Perth’s Bertha Park, the 1,100 roll West Calder High School stands testament to the demands of rising pupil rolls and the current trend for maximising amenity. Although not technically a community school it’s available for community use with a 20m pool, sports and community wing, teaching rooms and public areas with dedicated entrances enabling access when the rest of the school is closed. Most people will arrive by bus or car, courtesy of a £5.5m road bridge over the railway line to provide access to the A71. A significant expense for the £32m school. For everyone else a Sustrans cycle path links the village directly with the school. A brick wall extending out from a robust base-course helps mediate between low-rise homes and the giant interloper in their midst. A low-key reception area offers scant clues as to the ambitious scale of the school, travel forward a short distance and things soon shift up a gear or two as the space opens into a vast central volume which plays host to the full panoply of communal school functions from assembly hall and dining area and to performance space - akin to the journey from dressing room to pitch in a large football stadium. The client in this case was West Lothian Council who, from the outset, had a very clear notion of what they wanted with very little chopping and changing through delivery, as evinced by a CGI fly-through commissioned at planning which accurately details the finished design. Designed with pupil flow in mind the school is built to a detailed access strategy to guarantee navigation with a minimum of fuss, although it is conceded there will be an initial learning process involved. This involves the insertion of additional stairwells to avoid the sort of free for all’s witnessed at the old school where pupils were funnelled down narrow corridors. Pastel hued walls help to soften and individualise the large open plan spaces, with the promise of super graphics to come depicting a variety of sport stars and scientists; including Sir Andy Murray, Dame Katherine Grainger and Sir Chris Hoy. 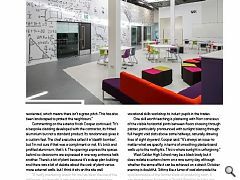 This open plan ethos extends to the fitness suite and PE rooms which have their own visual connections. There are of course more intimate spaces on offer, notably the library, or learning resource centre as it is now referred to. The entire school estate is fully connected and internet enabled for pupils bringing their own device and includes unisex toilets with communal washing areas at the front to minimise bullying. Commenting on the exterior finish Cooper continued: “It’s a bespoke cladding developed with the contractor, its fritted aluminium but not a standard product. Its randomness gives it a custom feel. The chief executive called it a ‘stealth bomber’, but I’m not sure if that was a compliment or not. It’s brick and profiled aluminium, that’s it. The openings express the spaces behind so classrooms are expressed in one way, entrance halls another. There’s a lot of plant because it’s a deep plan building and there was a bit of debate about the cost of plant versus more external walls, but I think it sits on the site well. An overhang over the south entrance provides some environmental protection while side elevations provide additional access points with the services focused to the west. The idea is a building which sits on site with an ‘agricultural hood’ on top. 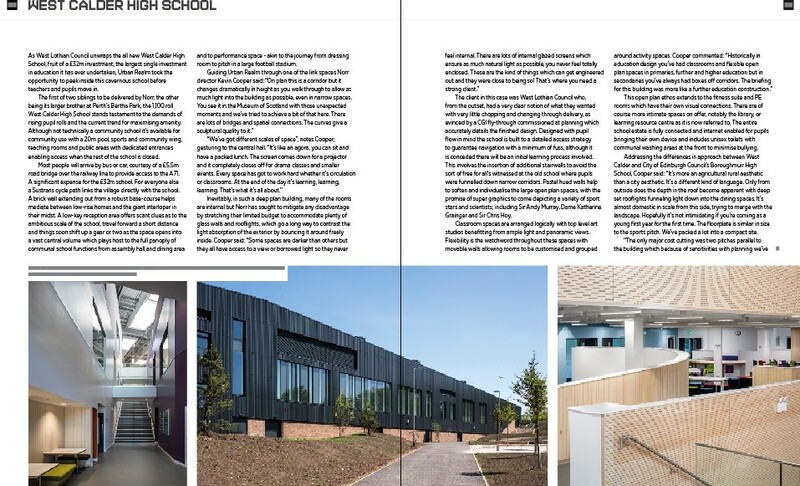 The service yard itself comprises kitchens, home economics, sprinkler tanks and a ‘little brother’ energy centre in the same form as the main building and even includes a vocational skills workshop to induct pupils in the trades. West Calder High School may be a black body but it does radiate a certain charm on a rare sunny day, although whether the same effect can be achieved on a dreich October evening is doubtful. Sitting like a lump of coal alongside the spoil landscape of the former shale oil producing town. It has already been likened to a ‘Stealth Bomber’ but the inky metal of West Calder High School provides scant camouflage amidst the rolling greenery of the West Lothian countryside. Instead it stands loud and proud as something more akin to an agricultural barn, impossible to miss.